You probably heard it here last but in case, you were in some alternate universe where Pantone is just some random sounds made together to mean the end of a meal, you’re in luck. 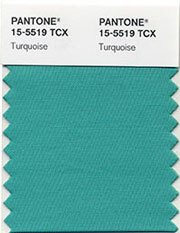 The world’s authority on colour and provider of colour to fashion and design houses plus many other industries, Pantone has declared Pantone 15-5519 or its much more famous namesake Turquoise colour of year 2010. Interesting. I’m loving the new colour, especially since it’s the designated colour for my horoscope. Oh it’s Sagittarius, since you asked. But here’s the ultimate clincher for me. If Pantone’s colour for 2009 Mimosa Yellow was chosen to send a “hopeful optimistic message” to the public, year 2010 would be the year we get to start fantasising about turning lobster red on sandy beaches. Cocktails, anyone? I’d even add a tiny umbrella in your drink, if you ask nicely.